We live in a paradoxical world. Be it expanding globalization, advancing medical technologies, or the immediate access to information, our world is rapidly changing in nuanced ways. Whether through an idealized version of ourselves posted on Facebook or the rapidity of accessing google maps, a tension line is forming between ease and frustration. While not holistically problematic it raises an ontological question of what it mean to live with.… live with the frustrations of no results, live with the rejections, live with the disappointments, live with the fact that sometimes the room is just too cold. We think that if we just work enough or exercise enough everything would be perfect. But from that point of view, we are doomed for failure. A metaphorical death of the soul. There’s no room for spontaneity or something new to arise. Sometimes we are going to arrive late. Sometimes we will arrive just on time. Sometimes we will say the wrong thing and sometimes we will say exactly what another needed to hear. That is the challenge and blessing of being human. 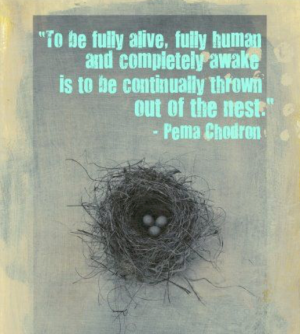 Just like the lotus blooms in the mud, we are continually thrown out of the safety of our nest. So that’s the blessing of it all—by knowing the terrain of the human experience we have choice. Choice to meet our discomfort head on and relax into the reality of that what is. Choice to relish in the joys of life and relax into the reality of what that is. Back and forth, openings and closing. In and Out. We are living breathing organisms, after all. Just like there is no cure for hot and cold, there is no cure for the inevitable fall from the nest.